« Dar and Matey on STAGE! There’s a lot of Dar and Matey fans out there. I know, because I’m one of them. Where did The Lunar Adventures of Dar and Matey, Estuary Pirates, Episode Two: Danger in 1/6th Gravity come from? And ultimately, where DO my plays come from? Generally, I start with an image or a hook that gets me excited to start writing. With Dar and Matey, I got an email asking if I would be interested in writing a play for a dark night series. I was in the middle of writing a play that was really challenging me…it happens…I’ll write about that another day…I’ll just say this: each play presents it’s own unique challenges and you have to choose to rise to it or not. So. I said yes. I’ll write a play for the dark night series. And now, I needed an idea. Two things came together in my head…one…Dar, see the above photo. 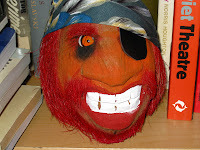 Dar is a coconut that I bought in Mexico this past January that had been cut and painted to look like a pirate. Now. I’ve always been interested in pirates. Who isn’t? (And this was before Pirates of the Caribbean.) I thought the coconut was hysterical. When I got home, it went right on the book shelf staring at me. I named him Dar…to some amusement in my home. And the other thing that went on in my head: I wanted to do a play that was just adventure. No reflection, no belly button staring, no single set. I wanted adventure. In the 19th Century they used to do plays that had volcanoes erupting, floods, earthquakes…the things that seem only reserved for film nowadays. At some point, theater turned away from telling those stories. So. Coconut head meet a Desire. Mix. Blend. A lot of my plays come from a collision of ideas and things I bump into. Forms, images, words overheard, they all come together during the process of creation. Each process is unique. With Dar and Matey, it came a desire to tell an action-adventure story on stage and an object. Umbrella began with the image of two people walking late at night. And with another play, On the Night of Anthony’s 30th Birthday, Again, it began with the idea of writing a single door farce.